an atmospheric circulation pattern in which the atmospheric pressure over the polar regions varies in opposition with that over middle latitudes (about 45 degrees N) on time scales ranging from weeks to decades; the oscillation extends through the depth of the troposphere, and from January to March, it extends upward into the stratosphere where it modulates in the strength of the westerly vortex that encircles the arctic polar cap region; the north atlantic oscillation and arctic oscillation are different ways of describing the same phenomenon. evaporation (steam) fog produced above a surface of open water within arctic ice when the air is stable and relatively cold. the northern limit of tree growth; the sinuous boundary between tundra and boreal forest; taken by many to delineate the actual southern boundary of the arctic zone. (1) geographically, the area north of the arctic circle (66° 34′ N) (2) (same as tundra) biogeographically, the area extending northward from the arctic tree line; also used for the level above the timber line in mountains. sharp, narrow ridge formed as a result of glacial erosion from both sides. the process of inducing or maintaining a frozen condition in earth materials by artificial means. as commonly used in weather observing practice, an observable occurrence of particular physical significance within the atmosphere; from the viewpoint of weather observations, the atmospheric phenomena include all hydrometeors (precipitation types and fogs), blowing snow, thunderstorms, tornadoes, waterspouts, and others. longwave (infrared) radiation emitted by or being propagated through the atmosphere. luminous phenomena, in the form of arcs, bands, draperies, or curtains in the high atmosphere over high latitudes; auroras are related to magnetic storms and the influx of charged particles from the sun, the phenomena are called aurora borealis in the northern hemisphere and aurora australis in the southern hemisphere. 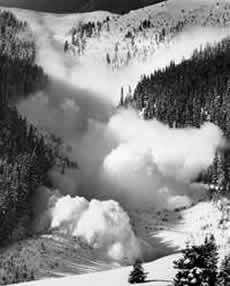 mass of snow which becomes detached and slides down a slope, often acquiring great bulk by fresh addition as it descends. arithmetic mean (m) of a number (n) of values (x1, x2, ... xn), defined by the equation: m = sxi/n; annual average value is calculated from 12 monthly means; daily average (or mean) value is calculated from 24 hourly readings of a meteorological element, or often from the average of the daily maximum and minimum values (for example, of temperature); monthly average is usually calculated as the average of the daily average values. the semipermanent subtropical high over the North Atlantic Ocean, especially when it is located over the eastern part of the ocean; the same high over the western part of the Atlantic is called the Bermuda high; on mean charts of sea level pressure, this high is one of the primary centers of action in northern latitudes. a distinct soil micromorphology, resulting from the effects of freezing and thawing processes, in which soil particles form subhorizontal layers. a barometer that records barometric pressure over time (days or weeks). an instrument for measuring atmospheric pressure; two types of barometers are commonly used in meteorology: the mercury barometer and the aneroid barometer. areas of discontinuous vegetation cover in the polar semi-desert of the high arctic. a layer of unfrozen ground that is perennially cryotic (t < 0 degrees Celsius), forming the basal portion of the permafrost. the cryostructure of a frozen deposit of boulders that is saturated with ice. the sliding of a glacier over bedrock. the cryostructure of a frozen layered deposit of gravel and boulders that is saturated with ice. a stream characterized by narrow reaches linking pools or small lakes. an ocean and ice circulation pattern in the Beaufort Sea, north of Alaska. This gyre moves in a clockwise direction, fed by an average high-pressure system that fosters anti-cyclonic winds. Ice that forms in or drifts into the Beaufort Gyre has historically remained in the Arctic ice system for years, accumulating snow and thickening each winter. Beginning in the late 1990s, the ice began melting away while in the southern parts of the gyre, before completing the circulation. hard-packed rock lying below the Earths surface; lies in beds or layers; can be variable across geographic space; above bedrock is a layer of broken, weathered rock. a long area of pack ice from a few km to more than 100 kilometers in width. crevasse that separates flowing ice from stagnant ice at the head of a glacier. 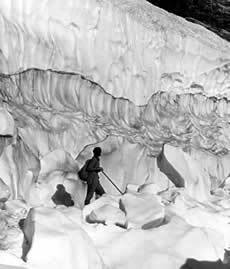 Explorer on Skillet Glacier in 1936. Bergschrund is visible as the dark band of ice in the background. the semipermanent subtropical high over the North Atlantic Ocean, especially when it is located over the western part of the ocean; the same high over the eastern part of the Atlantic is called the Azores high; on mean charts of sea level pressure, this high is one of the primary centers of action in northern latitudes. situation of a vessel surrounded by ice and unable to move. an extensive crescent-shaped indentation in the ice edge, formed either by wind or current. a lead closed off on all sides within the ice pack. winds of at least 35 miles per hour along with considerable falling and/or blowing snow reducing visibility to less than one-quarter mile for a period of at least three hours (extremely cold temperatures are often associated with dangerous blizzard conditions, but are not a formal part of the modern definition). a surficial layer of angular shattered rocks formed in either modern or pleistocene periglacial environments.